Flipboard is a new, free application for the iPad which has one basic function: to take your social networking tools (read: Facebook and Twitter) and turn them into social "magazines." 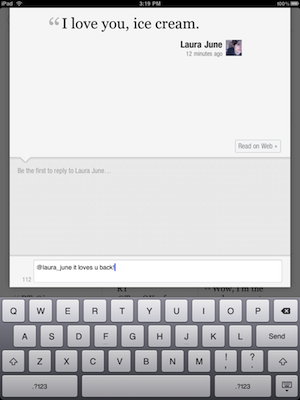 As you can see from the screenshots -- which are all culled from my Twitter stream -- the application is very attractive. Read on for my full impressions. After downloading Flipboard you enter your Twitter and Facebook details into separate streams, and those streams are then turned into "magazines," -- and they do, indeed look just like magazines. The attractive print-style layouts present you with pages of recents tweets, articles (pulled from the links in the tweets of those you follow), and the opportunity to respond from right within the app itself. What's not to love? Well, it's got its limitations. First off -- it's not primarily a communication tool, in that while you can respond, you don't see any of the peripheral information that is available on Twitter: people who respond to you that you don't follow, for instance, are nowhere to be found, leaving the app to present Twitter as something of a closed circuit. Additionally, any re-tweets using Twitter's official Retweet function are not here, either. Beyond that, anything you want to do within Twitter beyond reply -- such as view a profile or follow a new person -- loads you into Safari. In this way, the integration experiences reminds us of the Kin's clunky realizations of Facebook and Twitter... and that's not a good thing. Of course, Flipboard isn't a Twitter app, so our complaints are relatively picky. 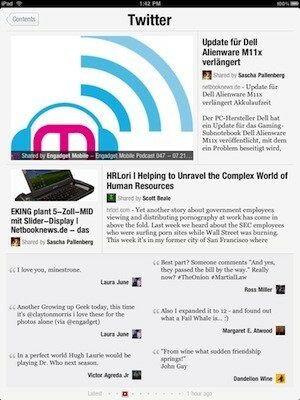 As a social magazine, what it presents is... hmm... a little uneven as well. Beyond saying over and over how attractive it is (love the font choices! ), I can say that many images render extremely poorly because Twitter functions on small, low quality images and any resizing up causes our eyes to bleed. Moreover, because it turns each link tweeted into an article on a "page," we noticed how often many of the people we follow tweet the same link, the same story, the same meme... and Flipboard seems to deal with that by simply skipping over duplicated links -- a fine strategy, we get what you're going for, but because the application also filters out any text tweeted with the link, the "conversations" suddenly seem pretty broken to us. On top of that, as of now, it's having some serious issues displaying certain blogs -- we're seeing tags and meta data exposed all over the place in a way that makes, well, reading, a little difficult. Flipboard, rather unsurprisingly, is awash in Web 2.0-ness, and as such, many have noted its failure to expose author attribution in a way that's helpful or accurate... instead, we get to see who "shared" the item, which looks and feels pretty misleading, and it's something we wouldn't be surprised to see evolve or change as the app develops. In fact, in the app's provided FlipTech feed, you get semi-proper attribution -- TechCrunch articles appear under the "TechCrunch" name, but I can't tell if the article was written by MG Siegler or Michael Arrington -- a distinction that may not matter to some, but certainly will to plenty. Slightly more troubling is the fact that FlipBoard essentially scrapes sites of their content and reformats it for display on its own servers, which seems to us like a definite copyright no-no -- we can't imagine too many publishers are going to be happy to see their content ganked like this without compensation or attribution. We don't know all the answers here, but we'd bet that Flipboard is about to get some very serious calls from curious lawyers in the near future. Finally, the app can be terribly slow to load, and it doesn't update or refresh fast enough to suit the most avid social networkers. Of the two iPads I worked with in testing, one of them has still failed to load in any account information because of server overload, and the other is running at least 15 minutes behind Twitter's actual timeline, though it seems to have an easier time staying on top of Facebook. Now, I like many people, use Twitter primarily as a working tool (plus for joking around and talking about food), and Facebook as a family and friends tool, so their respective "magazines" have incredibly different character (I'm not screenshotting any of the Facebook stream because it looks exactly the same as the shots I've presented here, and because I really doubt most of the people I went to third grade with want to be on Engadget). While I'd say that, overall, my Twitter magazine is more interesting than the Facebook magazine, it's also far, far more repetitive -- but maybe that's just because my circle of people I follow is rather small and insulated. There are other bugs I'm assuming will be worked out -- such as the fact noted above that in my check, not nearly every Tweet was represented, they update extremely slowly, and they are not always presented in the order that they actually appeared -- all issues that are very problematic for a social conversation tool. And, last but not least, this morning when I loaded up the app for the first time in twelve hours, everything from yesterday has ceased to exist, and was replaced by a new "magazine" -- roughly three pages of tweets from the last two or three hours. So, if I wanted to look through anything older, well, as far as I can tell, I'm out of luck. Which leads me to the question... who is this going to be useful for? It's an interesting idea, of course, but who follows enough people on Twitter to make this application truly entertaining? I follow almost 200 people, and have almost 2,000 followers -- so this application allows me to interact with far less people than I do on a normal basis, i.e., just those nearly 200 that I follow. Like I said, that's not going to be a drawback for everyone, but it will be for some (such as myself). Don't get me wrong -- Flipboard has a lot of potential to be an engaging and powerful new way to look at our social media. It just doesn't have enough meat to keep me interested yet. For now, it's just like that subscription to Vogue I got a few years back: it seemed like a great idea at the time, but turned out to be suspiciously lacking in content in actuality. Hey, at least this one doesn't take up as much space!